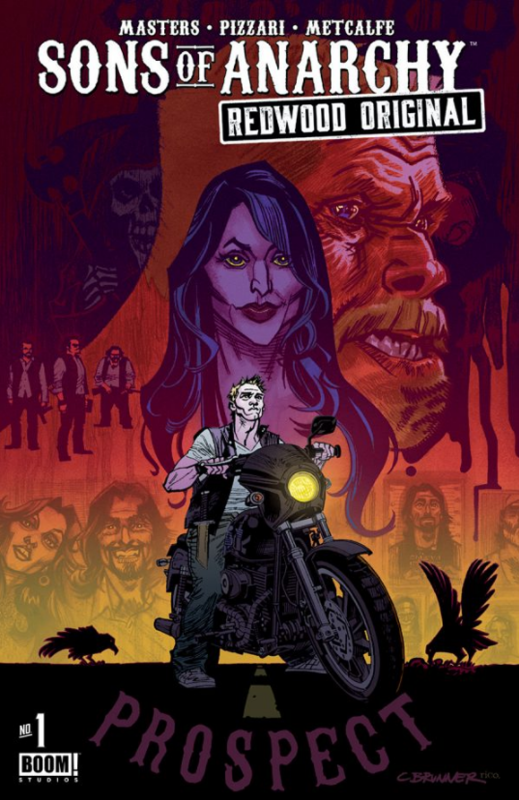 Sons of Anarchy: Redwood Original #1 Review – AiPT! Kurt Sutter’s FX series Sons of Anarchy was highly successful. For six years we watched Jax Teller struggle with his father’s death, a controlling mother and how to turn an outlaw biker gang into a legitimate business. For those of you still yearning for high speed chases, bloody fist fights and general mayhem, look no further–Ollie Masters has your fix. Masters and team, with inputs from Sutter, have brought to life a prequel comic that feels like you never turned your TV off. This comic brings us back to the days before Jax’s rise to power. Jax is an impetuous eighteen year old processing his father’s death and trying to earn the respect of the club and his patch. Issue one reveals a taste of the tenuous relationship between Jax and his step father Clay. We see Jax’s pent up emotions about his father’s death and Clay’s surprising insecurity. Masters’ has done a tremendous job of capturing the essence of what it is to live life as a “Son” without a father. His dialogue is on point, down to the banter between brothers during a drug deal. As a fan of the TV series I could hear the characters saying the lines in my head. The story transitions are very well done. You never feel jerked out of a moment or wonder why something is happening. Luca Pizzari’s depictions of the SOA family are uncanny. He does a marvelous job of portraying body types and movement under the many layers of flannel and leather. If you watched the show you will recognize the familiar faces and if this is your first ride with the “Sons” you will enjoy the expressions and emotions delivered in each panel. I particularly enjoyed the use of cigar/cigarette smoke to add interesting blank space in the frames and erode the boxy structure. I found Adam Metcalfe’s coloring a bit heavy handed when it came to shadowing–for example, the face of Jax’s hookup and the shadow under Clay’s leg in the bar scene. The girl Jax is kissing seems to have an eye mask or crazy makeup on in one scene and then nothing at all in others. Clay’s bent leg shadow almost gives the appearance of a prosthetic leg. On a high note, the muted color palette works very well to depict time of day and artificial light. The muted colors also make the blood pop off the page during the fight scenes, bringing the violence to a higher level. Did I like It? Yes. Sons of Anarchy: Redwood Original doesn’t ride sissy. The brawling begins early and the story is a terrific tribute to the TV series while remaining a standout in its own right.